Children with special needs are the centre of attention in INTI’s C.S.R. (Cares, Supports, Returns) initiative to create awareness of and support for the underprivileged in society. Organised by the School of Business (SOBIZ) of INTI International College Subang (IICS), C.S.R. comes under the faculty’s newly launched Social Enterprise Unit (SEU) that will promote philanthropy and community service among students and staff. 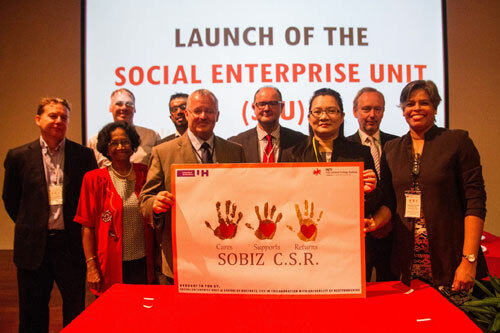 Andrew Francis (fifth from left), Head of Department – Marketing & Enterprise, Hertfordshire Business School, University of Hertfordshire with Tan Ling Ling (third from right), Chief Executive of INTI International College Subang at the launch of the Social Enterprise Unit together with the dedicated team from the University of Hertfordshire and INTI. C.S.R. focuses on three main drivers starting with Philanthropic Initiatives, which will provide support to key charities through annual charity drives that will become signature events for the SEU. The second driver is the CSR Competition, through which students will apply knowledge from the classroom and out-of-the-box creative thinking in creating and executing a business plan to raise funds for charity. The final driver is Social Enterprise which is focused on knowledge and skills development executed through a series of workshops, seminars and forums organized for the public. Themed “Little Dreamers”, this year’s SOBIZ C.S.R. initiative is backed by a strong conviction that opportunities for knowledge development and enhancement should be made available to all, especially children with special needs. “One of the key values that we want to nurture in our students is empathy and School of Business’s SEU provides a platform to achieve this by providing different avenues for our students to organize, raise funds and increase awareness through a comprehensive approach that involves engagement with the public,” shares Sotheeswari Somasundram, Dean, School of Business at INTI International College Subang. Organized in collaboration with the University of Hertfordshire (UH), INTI’s long standing academic partner from the UK, the idea of SOBIZ C.S.R. was generated from UH’s long running CSR initiative which has seen numerous successes over the years and has created positive impact on the local community in the UK. Through the development of the three drivers tied to SOBIZ C.S.R, the team hopes to create a similar impact on the local community here. Some of the events lined up for the first SOBIZ C.S.R. initiative include a Small Medium Enterprise Workshop to stimulate knowledge sharing among SMEs; the Junior Dragon’s Den Challenge, an emulation of UH’s long running successful challenge where students apply learned knowledge to raise funds; a charity concert dubbed MyArts Concert fully organized by the students of the Diploma of Mass Communication; and a Charity Gala Dinner that represents the finale of the C.S.R. week which encapsulates the essence of giving and sharing. All funds raised during the campaign will be donated to Teach for Malaysia, United Voice (Persatuan Advokasi Diri Orang Bermasalah Pembelajaran Selangor and Kuala Lumpur), Persatuan Kanak-Kanak Istimewa Kajang and Orkids Malaysia, a foundation which cares for children with Down syndrome. For further information on SOBIZ C.S.R initiative, please call Amrita Dhillon at 019-311 2186 or amritadhillon.dalbir@newinti.edu.my.